This is an exciting moment in the 49-year history of the Cabot Heritage Corporation and I’m so pleased that you can be a part of this incredibly historic occasion. It’s one that’s not only been in the making for some time but one that our readers have written, called, and practically begged me for years to create—a Total Wealth advisory that would bring you the top picks across all seven of our market-beating services. It technically cherry-picks the most profitable stocks across all of our seven advisories weekly—and can do so even in periods of recession, inflation and market downswings. Had this Total Wealth system been in place here at Cabot 49 years ago, here are a few of the documented gains you could have banked by owning our biggest winners. That’s why I’m so excited today to tell you about this system and how it can hand you the kind of wealth, freedom and lifestyle you’ve always dreamed about. We call our Total Wealth system Spectrum because it automatically selects the No. 1 stock across all seven of our advisories on a weekly basis—and without your having to subscribe to all seven of our advisories. We think you’ll call it a dream come true. If at the end of my invitation you agree, I’d like to extend to you a personal invitation to preview and profit from Spectrum. A higher-performing portfolio of stocks with instant diversification among big-cap stocks, small-cap stocks, income stocks and global ADRs. You’ll also understand why we’re limiting access to Spectrum system to 500 new readers and why it’s important that if you like what you see, you’re going to want to be one of the first to join us before we close the doors. Mark my words. Once you see everything, you’ll never again worry about beating the market; you’ll thrash it! … you can begin to understand the incredible power Spectrum offers you and why we consider it the biggest discovery in our 49-year history. Timothy Lutts heads one of America’s most respected independent investment advisory services, publishing 12 newsletters to more than 250,000 subscribers around the world. Combining time-tested investing systems with expert editorial content, these newsletters serve not only to make readers richer investors but to make them better investors. Under Tim’s leadership, Cabot has been honored numerous times by Timer Digest, The Hulbert Financial Digest, and the Specialized Information Publishers Association as ranking among the top investment newsletters in the industry. Today, Cabot’s 12 financial advisories have accumulated one of the best track records on Wall Street, doubling investors’ money 281 times while handing investors gains of up to 12,037%. When my dad, Carlton Lutts, founded the Cabot Growth Investor in 1970, he did so with one goal in mind: to provide individual investors the most profitable investment advice on the planet. Over the past four decades, I’m proud to say that the momentum-based stock-picking system he created back then not only has doubled our readers’ money 281 times but also has made many of our readers rich—not only through our flagship Cabot Growth Investor, but through all of our advisories, which cover the entire investing world, where we have applied our scientifically advanced, momentum-based stock-picking system. If you have been one of our long-term readers, I sincerely hope you have profited from our results, because that was my dad’s goal from the beginning. Frankly, this is why in a world where hundreds of investment advisories come and go each year, Cabot has stood the test of time for over four decades. That’s because we have always taken our responsibility to bring you the best research, analysis and recommendations on the planet seriously, and because we know you will be investing your life’s savings in our recommendations and we don’t want to let you down. That’s why Spectrum is so personal to me—as it represents a bold new way to help our family of readers profit from our top picks across all seven of our stock advisories. This is also why I believe Spectrum will make the same kind of mark on Wall Street that our Three C system did more than 49 years ago on growth investing—and it continues to deliver market-beating results today. Approach to Growing Your Wealth? That’s a great question … and really the prime reason we spent two years, 5,000 man-hours, and more than $500,000 developing this system—all to create something that never existed before. A total wealth-building approach that combines the market-beating advantages of our Cabot Growth Investor, Cabot Dividend Investor, Cabot Small-Cap Confidential, Cabot Top Ten Trader, Cabot Emerging Markets Investor, Cabot Marijuana Investor and Cabot Undervalued Stocks Advisor—all in a powerful new way that capitalizes on their winningest stocks. Trust me, it was not easy—creating a formula for identifying the market’s most profitable stocks among our seven advisories while avoiding the underperformers. We had countless setbacks along the way. However, that problem was finally solved by creating a proprietary computerized ranking system for selecting the top stock among our seven advisories. We did it by creating a technical overlay to identify the best investing opportunity for the week based on (1) current market conditions, (2) how fast sales, earnings and cash flow are growing, and (3) analyst earnings revisions by sector. As a result, your profits are no longer limited to one sector or investing approach. That’s because Spectrum brings you the best stock available for purchase that week—whether it be a fast-growing small-cap, big blue chip, high dividend payer, undervalued play or Global ADR. That’s what makes it a total wealth approach—as it combines the market-beating advantage of our seven stock advisories in a special way that guarantees you our most profitable stock on a weekly basis. These are actual gains that our No. 1 picks across our seven advisories have handed our readers over the past 49 years that you’ll now begin to receive on a weekly basis—all thanks to Spectrum’s ranking system that cherry-picks the highest-performing stocks among our advisories. Best of all, Spectrum does this all for you without any guesswork on your part—not only identifying the most profitable stocks across all of our publications but also alerting you when to sell them and which new opportunity to roll your profits into. This is why it took us two years and more than 5,000 hours to develop the system making all this possible. The results have made it possible for us to place both the Cabot name and the Cabot guarantee on this proprietary system, as it truly brings you the most profitable stocks on the planet on a weekly basis. That’s why today I’ve sent you this special notice: to give you the chance to join our Cabot Stock of the Week advisory, which guarantees you the most profitable stock across all seven of our stock advisories 50 weeks a year. Stocks that are guaranteed to bring you long-term gains of 500%, 1,000%, 4,000% or more for as long as you’re a member. This letter is your invitation to try our Cabot Stock of the Week advisory, and we hope you’ll seriously consider joining us. Cabot Stock of the Week takes the guesswork out building wealth once and for all. That’s because it automatically helps you build the high-growth portfolio of No. 1 picks across all sectors. As a member, you’ll always own the best of the best, culled directly from our seven market-beating advisories. As a result, you’ll never again miss out on a fat money-doubling trade or big sector move because you’ll always own our No. 1 pick. All without your having to subscribe to seven separate advisories. You’ll find nothing is easier…. That’s because Spectrum automatically zeroes in on the No. 1 pick for each week and sends it directly to your inbox every Tuesday. If you are already a member of our Cabot Growth Investor, Cabot Dividend Investor, Cabot Small-Cap Confidential, Cabot Top Ten Trader, Cabot Emerging Markets Investor, Cabot Marijuana Investor or Cabot Undervalued Stocks Advisor, then you already know how simple we make it to profit from our recommendations. Cabot Stock of the Week operates the same way, by telling you what to buy, what to pay, when to sell, and which new Cabot Stock of the Week recommendation to roll your profits into with easy-to-follow, plain English instructions a kindergartner could follow. We’re limiting our membership to just 500 new members for the next 12 months for three reasons. Because Cabot Stock of the Week brings you Cabot’s No. 1 stock for the week, we cannot accept too many members, since too many investors buying our top pick each week could push our recommendation above our buy prices. We want to give our faithful Cabot readers the opportunity to get in on the ground floor of something exciting that we believe will become very profitable. Just like we did for our faithful readers who joined 49 years ago and have seen their money double 281 times, we wanted to give our Cabot family of readers the opportunity to be a part of something special and to profit from our total wealth approach. And while our top picks have handed our readers gains of up to 12,037%, we want to make sure our newest picks continue to deliver on the double, triple, and quadruple-digit gains we have promised here. Thus, we want to make certain that our members are 100% satisfied with their results. The best way for me to ensure that you will get the service and the results I’ve promised here is to limit our service. Which is why, if you like the results and exclusivity we’ve spelled out so far, I would suggest you RSVP immediately. During the past week, more than 50,000 Cabot readers have expressed an interest in joining us. His is just one of dozens of letters we’ve received since we started talking about Spectrum. And while I can’t tell you how many of those will ultimately sign up, I can tell you this: Based on the responses we’ve received so far, we will most likely have to turn people away. So if you think you want to join us, I wouldn’t put joining off too long, because once we hit our membership cap, you may have to wait until next year before we open the doors again. Our weekly top picks will give you an opportunity to turn $10,000 into $25,000 in a year … into $100,000 in three years … and into $1 million or more over the next five to ten years—just as they have since we launched our first advisory 49 years ago. Only now you’ll be able to receive our No. 1 picks without having to subscribe to seven separate advisories. We bring them all to you each week through Cabot Stock of the Week. For more than 49 years, the Cabot organization has helped hundreds of thousands of investors like you safely and systematically build their wealth through our seven market beating advisories. As you know, we stake our reputation on every recommendation we make in every single one of our publications. We take the trust you place in us seriously. That’s why you can expect to receive the same kind of institutional-level research and advice as a Charter Member of Cabot Stock of the Week along with a number of exclusive benefits not available to the general investing public. Direct access to our Spectrum system, exclusive to Cabot Stock of the Week, which has been tested and proven to cherry-pick the most profitable stocks across all of our seven advisories weekly—even in periods of recession, inflation and market downswings. 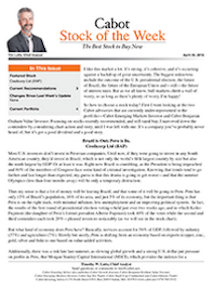 50 weekly issues of Cabot Stock of the Week, delivered directly to your inbox every Tuesday. Each issue will bring you the No. 1 stock across all of our advisories along with a panoramic overview of recent and upcoming events that will affect your money. As I regularly remind my Cabot Wealth Advisory readers, in order to beat the market, you must regularly adjust your holdings to make sure the stocks you own not only are in the fastest-rising sectors but also leading those sectors through increasing sales and earnings. Through the pages of Cabot Stock of the Week, we will show you how to do just that on a weekly basis. That way you will always own Wall Street’s most profitable stocks. As a member, you’ll receive 24/7 access to our private website, featuring the most recent issue and alert, your FREE special reports and forecasts, and our archive of past issues and reports. We know how important it is to make the right decisions with your money. That’s why we have brought aboard five full-time customer service representatives committed solely to Cabot Stock of the Week. Should you have any questions concerning Spectrum, our recommendations, or portfolio adjustments, they will be here to take your calls every day the market is open from 9:30 am to 4:30 pm Eastern time. Of course, just as with our other publications, you can always write me and get a written response within 48 hours. It’s all part of the special attention you will receive that comes with your Cabot Stock of the Week membership. For more than four decades, the Cabot organization has earned not only the trust of the professional investment community but that of its readers as well. Frankly, we wouldn’t have been around this long if we simply delivered quality research, analysis, and, most important, results. Our goal from the beginning has always been to make certain that we always provide our members the best and most profitable investment advice on the planet. If you feel that Cabot’s Stock of the Week is not delivering on this promise, if you’re not 100% satisfied with your results in the first 30 days just let us know and we’ll send you a refund on the balance of your subscription—no questions asked. If you decide to join us on a monthly basis, just advise us when to terminate your membership and we’ll cancel it before the next monthly charge. When you add up all the benefits, we expect our service to sell out quickly—especially because we will be giving our Charter Members a special discount price for joining this groundbreaking advisory. Because enrollment in Cabot Stock of the Week begins today and will continue for the next seven days or until we reach our membership cap, I sincerely hope you will take this opportunity to join us before all the seats are taken. And when I say, cheaper, I mean it. Considering the breakout profits our No. 1 picks have generated over the past 49 years, you would think it would cost a fortune to join. As a loyal Cabot reader and new Charter member, you’ll be able to join us for less than half the cost of our individual advisories combined. … you will receive Cabot’s Stock of the Week for the low annual membership fee of $997. That’s not only a savings of $2,882 but at less than $3 day, a steal of a deal considering you’ll be receiving Cabot’s No. 1 pick each week without having to subscribe to seven of our advisories. Again: With our money-back guarantee, that’s quite a bargain, considering you can cancel within the first 30 days and get a refund on the balance of your subscription while locking in our Charter Member price now. Naturally, I couldn’t offer you such a strong deal if I didn’t believe that Cabot Stock of the Week would deliver as promised. With our 49-year track record for building wealth, I believe you won’t be disappointed. When you add everything up, how can you possibly say no? Because tomorrow I can’t guarantee that any spaces will be available. Join me now and see for yourself the life-changing profits Cabot Stock of The Week can bring you from this point forward. I guarantee it will take your profits to a whole new level—our money-back guarantee promises just that. Over the past 49 years, our readers doubled their money more than 200 times owning our No. 1 picks across our seven advisories, with gains as high at 12,037%. When you join Cabot Stock of the Week, we’ll be able to send you our top picks directly to your inbox each week without your having to subscribe to all seven publications. … but why we expect this charter membership to sell out quickly. REMEMBER: Once these spaces are full, this Charter Membership offer will close. That’s why I urge you to sign up now. I believe it will be the most profitable investment decision you make in 2019. Click here now to secure your spot and lock in your savings.